US, 1986, 137 minutes (154 minutes: Director's Cut), Colour. Sigourney Weaver, Carrie Hehn, Michael Biehn, Lance Henriksen, Paul Reiser, Bill Paxton. 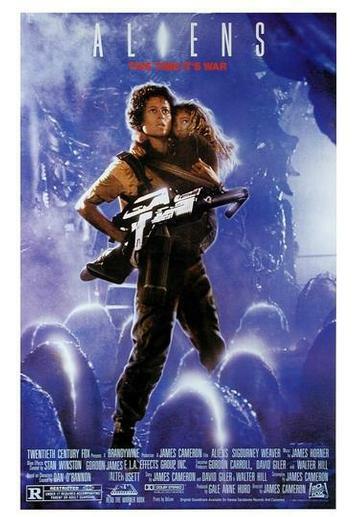 Aliens was one of the most popular films and box office successes of 1986. It is a rather delayed sequel to the successful Alien, directed by Ridley Scott, 1979. This film was written by David Giler and Walter Hill, using characters from the original (as well as many aspects of the original screenplay). However, the director is now James Cameron who made Piranha 2 and, more significantly, the successful Arnold Schwarzenegger science fiction thriller, The Terminator. The film has an atmospheric score by James Horner. It, of course, excels in the realm of special effects and stunt work. Sigourney Weaver was the sole survivor of the original and she takes up her same role here (commentators calling her action-packed performance 'Rambolina'). She was nominated for an Oscar for her performance. The film is set in the future, 57 years after the destruction of the space team in the original film. The aliens are still present - this time, however, there is a feminine/feminist perspective to the aliens, a mother alien who gives birth to the next generation but also wants to take captive the human girl. This means a conflict, finally, between the two women. While the film has a long running time, it is fairly action-packed, due to Cameron's skill in moving things along and setting up dramatic confrontations. Superior science fiction action. 1. The popularity of Alien? The necessity of a sequel? The effectiveness of the sequel? 2. A future world, the galaxies and dangers, exploration? The dark colours of the future world? The metallic tones, shadows? Eeriness? The gigantic star ships? The vast weaponry? The ugliness of the monsters? Special effects and stunts? The work of James Horner for atmospheric score? 3. The focus on Sigourney Weaver? her Oscar nomination and its significance? The woman and the heroics? The survivor of the galaxies? The true Amazon, yet true mother? The relationship between men and women? Power? Politics? Courage? 4. The using of the original plot? The passing of the 57 years? The deep sleep of Ripley and her cat? Changes in space? Toughness? Loneliness? The mining exploration? The predicament? The company men? The soldiers? 5. The dangerous situation, Burke and his concern? The plan? Gorman in charge? The use of the android, Bishop? Ripley and her advice? 6. The expedition: exploration, the discovery of the aliens, the patrol and the picking off of the individuals? The special effects for the confrontation between human and alien? Menace and horror? 7. Ripley and her leadership, the truth, support? The discovery of Newt? Relationship with Hicks? Gorman's death? The deaths, the dilemma, Burke's decision to use the nuclear device, the timing, the escape? 8. The men and their being killed? Hicks and his control? Bishop and his help? 9. Ripley taking charge? Other men and women in the background? Her capacity for fighting? Her relationship with Newt, motherly love, Newt's being taken, the build-up to the rescue? The loss of Newt to the alien? The final confrontation and rescue? The escape? 10. The aliens and their monstrous nature, appearance? Their hopes? The feminine alien and her eggs? The cocooning Newt? The struggle between the two mothers? 11. The comic strip action adventure style of the film and its effectiveness? Characters and types? Situations and timing? Tension and pace? Action? Audiences identifying with Ripley? Relief and victory? A gung-ho world? The saving of the world?